Prophet or messiah, the figure of Jesus serves as both the bridge and the barrier between Christianity and Islam. 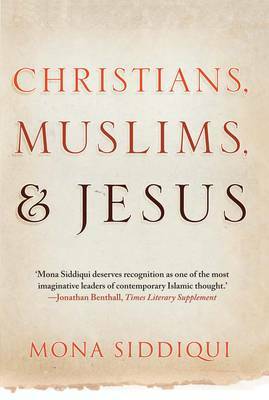 In this accessible and thoughtful book, Muslim scholar and popular commentator Mona Siddiqui takes her reader on a personal, theological journey exploring the centrality of Jesus in Christian-Muslim relations. Christian and Muslim scholars have used Jesus and Christological themes for polemical and dialogical conversations from the earliest days to modern times. The author concludes with her own reflections on the cross and its possible meaning in her Muslim faith. Through a careful analysis of selected works by major Christian and Muslim theologians during the formative, medieval, and modern periods of both religions, Siddiqui focuses on themes including revelation, prophecy, salvation, redemption, sin, eschatology, law, and love. How did some doctrines become the defining characteristics of one faith and not the other? What is the nature of the theological chasm between Christianity and Islam? With a nuanced and carefully considered analysis of critical doctrines the author provides a refreshingly honest counterpoint to contemporary polemical arguments and makes a compelling contribution to reasoned interfaith conversation. Why Can't They Get Along?